How “Modern” come into Being? Not just how but when, where, and why did modernity emerge? What was the interaction between artists, designers, and the public caught up in the unprecedented events that defined the twentieth century to this brave new world? The Great War of 1914 to 1918 ended a long and lingering nineteenth century, a century that stretched into the twentieth century, prolonging outmoded ways of life. Beneath the surface of the Belle Epoch, change was brewing and there were signs of discontent and impatience. Forward thinking and imaginative innovators began to redesign the Victorian era with an eye to a future they could not see. And then the Great War broke out in August 1914. By the cold and bitter Fall, it became clear that, disguised by the sentimental attachment to tradition, a modern and technological existence had been waiting to manifest itself. 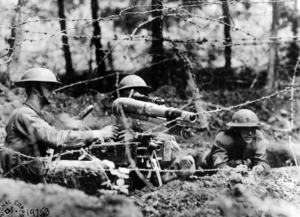 The War, that two decades later, would be known as the First World War, was a mechanized war: turning men into machines who used killing machines to kill each other in the thousands. Like Death on the battlefield, Life, it seemed, would also be commanded by the Machine. While artists adjusted to these cultural changes with some difficulty, designers leaped into the gap and created new products, new homes and new furnishings that expressed the twentieth century. But it should not be forgotten that modernity was not a disembodied artistic expression, modern life was an experience lived by human beings, who were both forced to accommodate themselves to their new existence and who also leaped at the chance to redesign themselves. Modern design is an art form that extended to ordinary men and women, who evolved into unprecedented social personages, new people that their grandparents would not recognize. The modern age that followed the Great War was nothing less than a total change in a visual vocabulary and the creation of a new grammar that allowed the modern world to speak a new language. 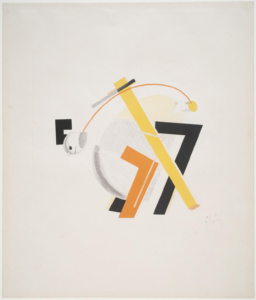 For the artists in the Soviet Union after 1917, the Russian Revolution provided a ground zero for them, inviting the designers to built a new social order. For the artists of defeated Germany, the struggle to rebuild inspired them to re-build their culture, from typography to mass housing. For America, emerging from the War as an inexperienced world power, technological prowess fueled a transformation in design. 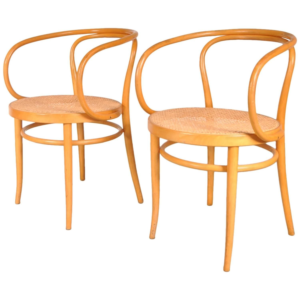 Fashion designers reformed the old bodies and architects built new homes for the new generation of the Jazz Age to live in and furniture designers fashioned new chairs for them to sit in and new tables for their new tea sets and cocktail shakers to rest upon. The result of the gyration from the old to the new was nothing short of a new aesthetic, a new philosophy that meant that from France to England to America to Russia nothing looked the same. The entire Western world had undergone a drastic interior redesign. In the decade following the Great War, there was a surprising explosion of art and design as artists sought to remake and to heal a world torn apart by a terrible contact. Unlike the end of the Second World War when it took the combatants a full decade to recover, the post war years, the 1920s, eagerly redesigned society and culture, making it fit for the new century. We have inherited this tremendous effort and as we near the centenary mark, it is time to pause and reflect upon the tremendous achievement of artists, designers, architects who gave us the visual culture we live with today. Indeed, it could be argued that the 1920s was the most influential decade in modern and post-modern art. The very idea of the domestic “house” was reimagined and this is the home we enjoy today. The basic human being was turned into a prosthetic half-man, half-machine with experiments that are still on-going today. Women were re-made into their own image of themselves. Men defiantly self-fashioned in a celebration of being alive. From furnishings in the private home to the public expression of posters, visual culture was recreated, almost from scratch by a remarkable process of invention. Today the histories of fine art and design are often divided from one another. Equally, when the histories of these disciplines are presented in the traditional mode, the histories are often divorced from the very social and economic conditions that inspired the artists and brought the art into being. This website attempts to demonstrate that far from being separated, art and design were integrated and creatively informed each other during the critical decades that gave birth to modern design, 1920s and 1930s. Modern design was born from a terrible war, a dramatic political revolution, a nascent feminist drive for equality, and the survival of a post-war generation intent upon making a better world. There seem to have been two driving forces behind the sweeping changes in art and design in the 1920s–technology and utopia. Technology has its own internal driving forces, each feeding off the other, pushing change onward, regardless of the consequences. The mindless drive towards dehumanization terrified the European population and inspired them to dream of a utopia, a vision driven by a desire to never repeat the horrors of the Great War. Architects and designers sought to build this new world where the lives of everyone, the masses, would be better and, as a result, the entire society would be uplifted. These dreams seem today to be absurd, but the dreamers were serious and their efforts to redirect the built environment towards collective ends was a serious vocation for these dreamers. During this post-war decade, the joint efforts of design and art merged and blended to create a decade dedicated to defining modernity and to defining what it meant to be a modern denizen of the very modern twentieth century. One of the salient properties of design is that what designers do shapes our lives and marks the way in which we exist. As humans we are designers but as humans we also adjust and react to the designed objects which enter our lives and begin to take part in our stories. In turn, we are made by designs which re-craft our bodies and re-boot our minds. There are times when a change in the design of everyday life can be quite sudden but, when examined carefully, each innovation has an ancestor and a long history of gestation. As shall be discussed, design evolves as if the individual artists are searching for the final form, looking for that one shape that is inevitable and perfect and once found this design sustains and satisfy…at least for a time. We seem to be at that particular time when we have inherited and accepted and continue to live within the culture designed for us one hundred years ago. One of the points this post seeks to make is that design and art were interchangeable and that this exchange a century ago was responsible for the modern visual vocabulary that continues to evolve in our own century. One hundred years ago, when the fine arts and design were integrated, artists were designers and designers were artists. Because there was no hard and fast line drawn between these two modes of creativity, often the artist and designer were the same person. The question is, then, what happened to disconnect art and design? For the American reader, the answer can be found in New York in the 1950s. In the wake of the Second World War, Europe was in ruins, the European art scene virtually extinguished or scattered and disrupted. 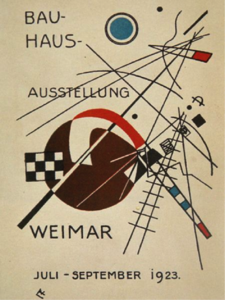 The inter-war avant-garde was wiped out. In France and England, an entire generation of artists had been denied the opportunity to develop and mature; in Germany, artists were summarily crushed under the weight of Nazism; in Russia, artists were slowly strangled into silence by the disapproval of the Stalinist government. Only in Italy did artists find any freedom and support, but the price was high–they had to become part of a fascistic regime and suffer the historical consequences of shame and humiliation and defeat. Only in America was there a thriving and lively art scene, and, by default, New York City took over from Paris as the center of the art world. 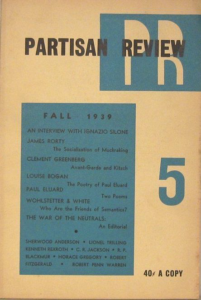 One of the few art critics who had the education, training and experience to create a discourse for American art as the inheritor of European Modernism was Clement Greenberg (1909-1994). Greenberg, a former literary critic, took up the task of writing American art, specifically that which was being made in New York, into history. In order to make certain this iteration of Modernism was worthy of serious consideration, he had to sort out the rather muddled and provincial local art scene. Unhappy with the regional art and the political art of the 1930s, Greenberg began the process of separating avant-garde art from he termed “kitsch.” Kitsch, by the time he wrote “Avant-garde and Kitsch” in 1930 meant the general inclusive understanding of what art was at an uncritical time. Absent of any local theory or aesthetic philosophy to define “art,” the public carelessly assumed that illustration and advertising, indeed, the whole of the visual culture, from comic books to magazine covers, was art. Greenberg began the process of clearing out this crowded and messy field, winnowing out the undesirables and making room for what he considered significant art. By the early 1960s, Greenberg, after twenty years of a sustained critical practice, had initiated an important discourse on the definition of Modernist art. In “Modernist Painting” from 1961, he freely combined the aesthetics of Emmanuel Kant with the dialectic of Georg Hegel and the formalism of Heinrich Wölfflin into a watered down but powerful theory of the progress of “art,” from the impurity of representation to the absolutism of the abstract. The result of Greenberg’s formalism theory of art for art’s sake was the elimination of illustration and of any creative practice devoted to utilitarian ends. Design was suddenly on the wrong side the the definition of what could be understood as “art.” The excision of applied art forms had the effect of foregrounding fine art, the art of galleries and museums. The exclusion made fine art stand out, all alone, without contenders or rivals to confuse the picture that defined “art.” This detachment of fine art from everything else was carried over into the writing of the history of modern art as it was developed in America. In New York, in particular, art history became a post-war cottage industry. Art historians on the East Coast learned the definition of art from Greenberg’s early teachings—the only art worthy of serious research was fine art and little attention was given to applied art. 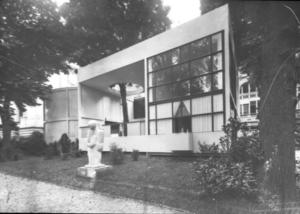 There were exceptions, of course, the Bauhaus being a notable example, but the reasons for inclusion were never clearly spelled out. Design history and theory existed but not in the critical mass that art history had accrued. Art history in other parts of the country followed and inherited Greenberg’s separation of art from craft and histories of design lagged behind for years. There were serious gaps to be filled in—the absence of women and people of color of non-Western cultures—rewriting the existing history of art was the task of the 1970s and 1980s. The fin-de-siècle job was to critique the previous generation of art critics, like Greenberg, and formalist art historians. Therefore, the rethinking of design continued to lab behind in historical analysis. Of course, over time, Greenberg’s concept outlived its usefulness and artistic expressions once excluded—decoration and representation and narration—were readmitted, first to galleries, then to museums, and finally to contemporary history. But Greenberg’s primary achievement, the division of fine art from everything else, has remained more or less unchallenged. In the twenty-first century, such divisions are no longer either necessary or desirable and there is a real need to rewrite the history of the early twentieth century in the terms in which it was lived. In the early decades, one hundred years ago, art and design were intertwined and interdependent. Picasso did not hesitate to design sets for a performance of the Ballets Russes, Parade, in 1917, and Matisse seized the chance to design stained glass widows for the Chapelle du Rosaire de Vence in 1951. Just as Jacques-Louis David proudly created parade floats for the French Revolution, the stigma of “applied art” simply did not compute for any of those artists, who, like David, were comfortable shifting from art to design. Unlike Abstract Expressionism, Bauhaus product design has not faded into history; unlike Minimal Art, the fashion of Coco Chanel is still relevant. This series of posts will demonstrate that the art and design of the 1920s still resonates to this day. There was an attitude that was unique to the early twentieth century, but was also inherited by the descendants of the remarkable decade, and that attitude was one of a complete and free exchange between art and design. Picasso, who made ceramic plates, thought like a designer and Dieter Rams, who saw the world in terms of curves and straight lines, thought like an artist. The line between art and design never existed, it was only written down and it is now time to erase this line.